A DA amendment has been lodged for Precinct E of the Clearview Urban Village Masterplan, a Seven Hills gentrification project of a former Tafe site into residential living. Located at 16 Tallowwood Street, Seven Hills the redevelopment also includes a Community Hub, Parkland, Bushland, and Wildlife Rehabilitation. A broader Masterplan was approved on the 12th of May 2014, forming a part of the Preliminary approval over the site. However since the original approval, according to the DA, due to a shift in the market, a single bedroom product option has been added to the development. Further modifications have also been made to the architectural design of the buildings, and a consolidation of the units into four towers, down from five. The proposal does not change the two-stage development strategy. The approved development comprised three towers in stage one and two in stage two. The proposal has adjusted this to now provide two towers in each stage, with stage one being the larger of the two. The development is proposed to roll out as a two-stage development. 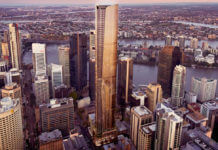 The approved development comprised three towers in stage one and two in stage two. The proposal has adjusted this to now provide two towers in each stage, with stage one being the larger of the two. 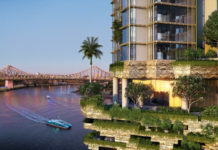 The development maintains a design whereby the buildings are centred around an open central open space which comprises of significant greenspace, a gym, outdoor dining facility and pool. 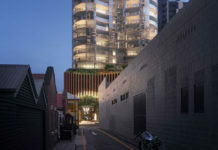 Architecturally, the proposed changes result in a more free-flowing building design, removing the previously proposed sharp, square edges, and now incorporating a built form more reflective of modern apartment buildings. The enhanced design, combined with the increase in open space, creates am enhanced overall aesthetic and functionality of the development. 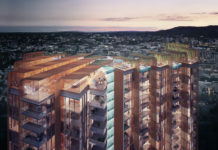 In additional to the gym, pool and barbeque pavilion in the centre court, a number of new spaces have been created including an additional rooftop pool and numerous communal rooftop terraces, and private rooftop terraces at some levels. These spaces seek to capitalise on the view afforded by the location whilst improving casual surveillance throughout Precinct E and the Clearview Urban Development. The ground level facilities and rooftop terraces are also accompanied by a number of interior spaces. Communal interior rooms include a Function Room, a Cinema / Lounge, and lobby lounge. Private open space has also increased with a number of units now being proposed with private rooftop terraces. The development application number for this project is A005149211.